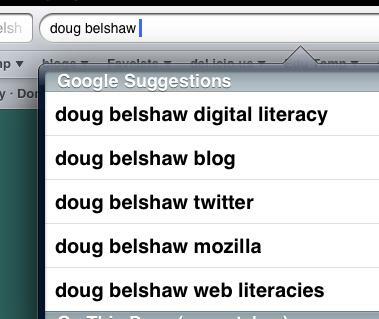 Like many education folk I follow Doug Belshaw for lots of good reasons. This week I bumped into Doug at Opening Educational Practices in Scotland Forum and launch (a lot to digest from that). Doug reminded attendees about the Survey: 5 proposals for Web Literacy Map 2.0 he is organising. After a quick review of the Web Literacy Map and other resources Doug listed I filled in the survey. This leads, backsides forward, to looking at the Map again. It is a great resource1 well organised and deep. It seems to add content every time I look at it. A couple of the questions were around the organisation and complexity of the map. I had a few thoughts. Given the complexity and depth of the resource I wonder if it would be interesting exposing it in different formats for folk to remix. Initially I though of JSON as I’ve made a couple of experiments with this in webmaker. I am now wondering if OPML might be an interesting approach too? This would export to most mind-mapping softwares. I’ve been playing with fargo occasionally and it might allow manipulation of the OPML too. The other thing that I was reminded of was the series of chats Doug has been recording with interesting and interested parties. For the most part I’d seen these stream by on Tumblr and only listened to fragments. Doug has put the audio on the internet archive with a nice CC0 license, so I’ve done a little remixing of my own. 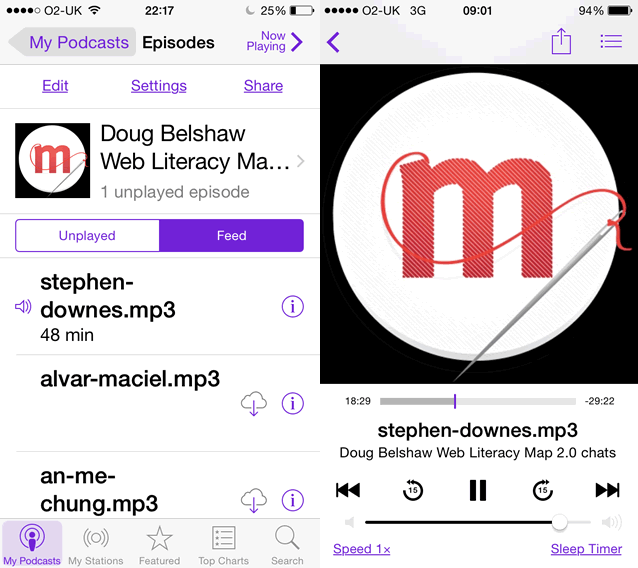 I’ve uploaded an RSS feed to my google drive: http://tinyurl.com/dougweblit2chats so that I can pull the audio onto my phone. I can then subscribe to this feed in the podcast app on my phone and listen on the go. (I use overcast as my usually podcast app but thought it might be nice to have this as a temporary separate thing). I’ve listened to the Stephen Downes episode on my commute this morning and if the rest are as interesting it will be a delight getting through them. Feel free to subscribe to the feed if you want to do the same thing, be aware I’ve made little effort to make the feed validate, the enclosures don’t have a length etc. 1. Caveat, I am not working with learners and have never taught Web literacy in any depth. I did teach some of ‘this stuff’ as part of teaching ict, blogging, podcasting and the like. On Monday evening I joined Doug Belshaw’s etmooc session on Digital Literacies. It was an interesting session, Doug spoke mostly to his thesis What is ‘digital literacy’ and a lovely set of slides T3S1: Digital Literacies with Dr. Doug Belshaw. Doug has archived, video and audio on the Internet Archive. I’ve added my audio recording to the Unofficial ETMOOC RIPCast where I’c collected some of the sessions I’ve attended and some I’ve missed. Doug took participants though some exercises in thinking about digital literacies working in a ether pad and in the blackboard session. I guess you needed a degree of digital literacy to keep up with it. Like Doug I do not believe in the idea of a digital native but am fascinated by how folk learn to read and write (watch, create, listen to etc) using digital tech. I believe that I’ve a reasonable degree of web literacy . This belief was challenged a bit as I watched folk start to define and redefine digital Literacies. It confirmed my suspicion that although I am somewhat digitally literate, I could not define what I mean by this. After the meet I still cannot. This reminds me of a quote, that I can’t quite recall or source, to the effect that a speaker of a language may not be able to make any true statement about that language. One factor in, if not measuring digital literacy, is a indicator, is the ability to be able to have fun in the language. Make jokes, puns, poetry and be relaxed when using it. 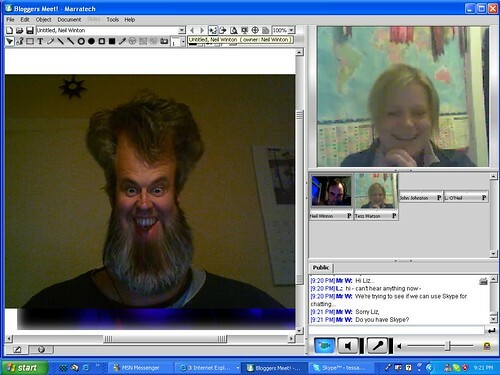 I recall, a few years ago(2007), a few Scottish Educators had join in using using Marritech for the first time. We were all, for that time, experienced users of ICT in the classroom , none of us knew what we were doing. All you could hear were gales of laughter as we explored the tools, whiteboard slides and the like making a ton of mistakes. This feeling of relaxed fun was quite different from the experience of watch many teaching professional using ict. I am not sure how we move folk into this experience other than by modelling it when possible. Towards the end of the session Doug explained his current work focuses on the more manageable task of creating a standard for web literacy. Learning/WebLiteracyStandard – MozillaWiki. This is very interesting stuff, and although I am sure that the grid Doug has produced, see Mozilla Web Literacies White Paper (v0.8) – Google Drive could be argued with it provides a great structure for thinking around the subject. All in all this episode of #ETMOOC has got me thinking far more than I’ve time to organise in a blog post. I’d love to see helping pupils become confident webmakers become part of mainstream education.